Hosting a successful party requires advanced planning. A party planning checklist makes keeping track of details easier and lets you enjoy the party as much as your guests! Get organized! Birthday parties, anniversary parties, holiday parties, and whatever-the-party: they all have different requirements. A detailed party planning checklist will help you plan your schedule and stick to your budget while managing the small details. Tailor your planning checklist to fit your party. Our free customizable party planning checklist template allows you to plan and manage all of your parties with ease. RSVP tracking, décor, menu ingredient lists, task schedules, you won’t forget a thing with our easy-to-use template. Download it for free right here. Then get ready to enjoy your get-together. First, determine your guest list. Use the checklist to keep track of how you invited them, such as their mailing address or an email address, the number of people in their party, and if they have RSVP’d. The template will keep a running headcount for you. Second, start planning the details. Estimate your entertainment budget. Will you be serving food and drinks? List your menu, the ingredients needed to make each item and the purchase price. The template will keep track of the cost for you. Include planning sections for decorations, music, and other supplies such as tablecloths, napkins, extra chairs, music and games. Third, set a schedule. The checklist template lets you create a detailed task list of everything that must be done ahead of time. Set dates and times for your tasks to be completed. List helpers for each task and include reminder notes where needed. Next, plan your party schedule. Sometimes good conversation leads to hosting distractions. Use the checklist to set reminders for party-time events such as serving cake or exchanging gifts. Lastly, smile and enjoy your party. Keep your guest list up-to-date. You can keep track of responses on the party planning checklist. Headcounts are important for planning food and drink servings as well as arranging seating. Don’t leave out details. 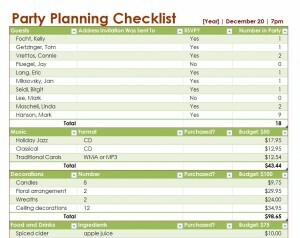 The party planning checklist template is customizable and easy-to-use. Supplies, incidentals, entertainment, schedules and activities can all be tracked. Take advantage of this so you don’t forget tiny details like asking to borrow your neighbor’s folding chairs or making extra ice. Budget wisely. Knowing how many guests are attending will help you to plan an appropriately sized menu and the amount of food and drinks required. Use your checklist to make detailed ingredient lists so you can track how much you are spending in creating or purchasing your culinary treats. Do the same with decorations and party favors. The template tallies your expenses for each category in your list. Set the mood. Don’t be caught off-guard trying to find the right music. Use your party planning checklist to plan your CD or audio music files ahead of time or create a playlist. Decorate. Even a few well-thought decorations can be appealing and set the tone. Use your party planning checklist to plan the type and number of decorations needed. Be detailed. Name plates, napkin rings, topiaries, candy dishes, and other accessories can add to the visual impact of your party, but also your budget. All good parties require planning and forethought. Use the Party Planning Checklist Template to make your next get-together stress-free.